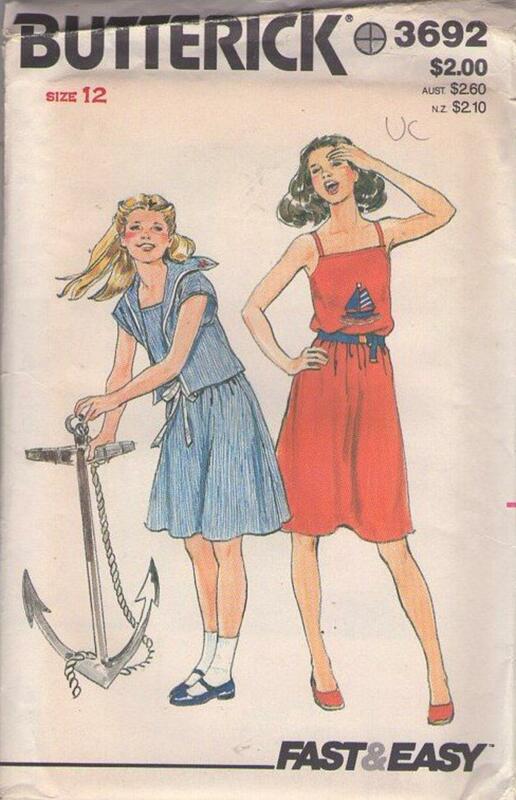 ​Bust 30", Waist 25.5", Hips 32"
70s Children, Retro Teen Summer Clothing Patterns - Loose fitting unlined jacket has sailor collar, extended shoulders, top stitch trim and purchased bias trim and star appliqués. Semi fitted dress 1” above mid knee has straight front upper edge, elasticized back upper edge, self shoulder straps, elasticized waistline, purchased ribbon tie belt and optional appliqué. Top stitch trim. Ahoy!